The lovely Ali from Fantastic Reads has done a post which I am ridiculously pleased to be able to share with you today. If you’ve not checked out Fantastic Reads, may I heartily reccommend it? Ali knows her children’s literature and her reviews and posts are always an utmost delight to read. Now – to back injuries and dragons! I am a fan of school stories. In particular I am a fan of the Chalet School, the fictional school first set up in the Austrian Tyrol in the 1920s, trilingual and international both in its pupils and staff, and in its education. I longed to enrol as a pre-teen attending a suburban comprehensive in the 1980s. Eustacia goes to the Chalet School, first published in 1929, was never one of my favourites, but is a book that, on recent re-reading, I realised I remembered almost every detail except one very important plot detail which I will outline later. It is a book I find quite troubling. Eustacia Benson is the daughter of an elderly professor of Greek and a Doctor (of what we are not told) who had “great theories on how to bring up children” (what these are we are not told). At the beginning of the novel both parents die suddenly, and Eustacia is left to the care of her married aunt who is the mother of five sons. Like Mary from The Secret Garden, Eustacia, an “arrant little prig” as she is described in the first line, upsets her cousins by telling tales. In desperation, she is sent to the Chalet School by her aunt and uncle. However, although it is hoped that European girls will be more sympathetic to Eustacia’s old fashioned ways (for example, she refuses to wear climbing breeches because they are “unmaidenly”), her tale telling, self-conceit and self-righteousness makes her unpopular in the school; in particular she and Joey Bettany (prefect and protagonist of the early Chalet books) clash. Eventually Eustacia decides to run away from school and gets caught in a flood. She is rescued but has damaged her back. “Stacie” as she is called after her accident remains in a wheel chair for several novels. On re-reading the novel, I was struck by the amount of punishment Eustacia undergoes. She is shaken several times. She is banned from the library for a month; for a book-loving girl, surely a terrible ordeal. She is ignored and snubbed, and finally terrified and temporarily disabled by her night on a mountain. Madge Russell, the owner of the school and Joey’s sister, describes Eustacia’s character, reformed through suffering, as having been buried deep inside her, but now they’ve “got those layers scraped off” Stacie can appear. The image of sloughing skin reminded me of Eustace Scrubb from C.S. Lewis’s Voyage of the Dawn Treader, and I realised why Eustacia’s punishment made me so profoundly uncomfortable. Again, a child is being punished for his intellectual, “advanced” parents. Again, the punishment is physical (Eustace is turned into a dragon; Eustacia is bed- then wheelchair-bound). Again, the language of redemption and deliverance is used as both are “born again”. Both Brent-Dyer and Lewis are profoundly Christian writers; in fact Cadogan and Craig in their study of girls’ fiction, You’re a Brick, Angela accuses the Chalet School books of “religious sentimentality”. This smacks of both bullying, inverse snobbery and self-righteousness on the part of both writers. I mentioned an important plot detail that I had misremembered. Eustacia is rescued by a rescue party made up of the school’s neighbours, and not by Joey Bettany, as I had thought. Joey is laid up after having had a tooth extracted. 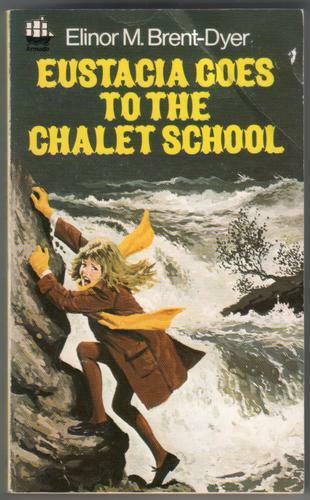 However, my mistake can be explained by Joey’s remarkable feats of rescuing: as Cadogan and Craig point out, in the first five Chalet School books, Joey rescues the lives of “six girls and a dog”! This is, however, one of the aspects of Chalet School stories I love so much; separated from boys and families, girls get an opportunity to be heroic. Long live the Chalet School! I’ve always been a bit uncomfortable with the way the other girls treated Eustacia, too. It’s one thing for Miss Annersley (I think?) to tell her that she has to conform to the expectations of the community; it’s another thing for the girls to get away with treating her like an outsider. I’ve never really blamed her for running away. I’ve never felt quite as sorry for Eustace, for some reason. Perhaps because he sneaked away to avoid work? Hey Su, your comment fell into my spam queue for some reason. Sorry for that – I’ve rescued you now 🙂 Thank you so much for your thoughts! Yes, it’s been too long since I re-read Eustacia for me to comment on that, but I think Lewis gives enough indication in Voyage of the Dawn Treader that Eustace’s punishment comes as a result of his behaviour, not his education. It’s true that his upbringing has left him with an under-developed imagination, which makes it harder for him to adjust to being thrown into a new world than it was for his cousins, but the sequence of events that lead up to him becoming a dragon are harder to lay at his parents’ door. Even in pretty dire circumstances, when a boy of his intelligence ought to have realised that their best hope of survival lay in working together, he refuses to accept hardship for the sake of the group: he openly criticises Caspian’s leadership but declines to offer any constructive suggestions when invited to do so (except his idea that the crew should spend days if not weeks rowing them back to the Lone Islands in hot weather on reduced water rations), he tries to steal from the rationed water barrel, and finally he sneaks off to rest while everyone else is working around the clock to repair the ship. Then, having got himself lost in the process, when he discovers the treasure his first thought is how to keep it all for himself. Lewis explicitly tells us that it is “sleeping on a dragon’s hoard with greedy, dragonish thoughts in his heart” [paraphrase] that turns him into a dragon. Perhaps his determination to keep himself outside of the community is a result of the way his parents have brought him up, but by the time he becomes a dragon, he has already had ample opportunity to see and understand that this attitude was of no benefit to anybody, not himself and not the rest of the Dawn Treaders. Thank you so much for your comment. Narnia’s not one of those series that I’m quite as familiar with as I should be, and your thoughts are truly insightful 🙂 Thanks again! Pingback: The Girls’ Own Blog Carnival: First round up « Did you ever stop to think & forget to start again? Pingback: Eustacia Goes to the Chalet School : Elinor M. Brent-Dyer « Did you ever stop to think & forget to start again? I also just noticed the similarities between the two books, “Eustacia goes to the Chalet School” and “Voyage of the Dawn Treader”, and came searching for other people who felt the same. The parallels are many: To recapitulate (most of this has been said above) 1. the names Eustacia and Eustice – not very common names. 2. the educated, “advanced” parents, with strange ideas about child rearing. 3.the protagonists’ feeling of superiority, 4. the protagonists’ belief that rules don’t apply to them. (Eustacia with the library, Eustace with the water rationing) 5. the protagonists’ need to get away from the crowd (Eustacia to the library, Eustace to the island’s interior) 6. the protagonists’ running away. 7. a physical “punishment” as a result. 8. redemption, being “born again”, the imagery of slewing off hard layers. Is it reasonable to think that there was no influence? It would have made sense if Brent-Dyer had read “The Voyage of the Dawn Treader” first, but “Eustacia” was written about 20 years earlier. I’m wondering whether Lewis came across “Eustacia” – rather unlikely, unless a female friend told him about it. Hi! Firstly, an apology for taking so long to approve this. Secondly, a thank you for your fascinating comments! I’m so intrigued about the whole thing. I presented a paper on Eustacia a while back and one of the comments mentioned ‘ The Return of the Native’ and Eustacia Vye as a possible similarity. I suspect there’s something quite interesting to be puzzled out here…!